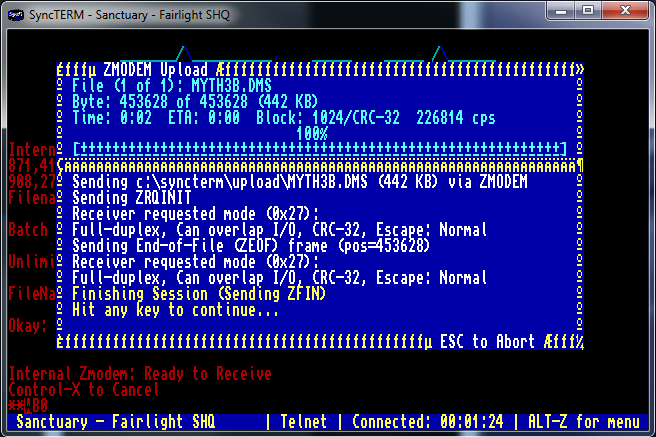 Hello, upload to my bbs is fast but download is like the old modem speed. Is there anything to do to speed up the download speed? I made the same settings to all the files, but still upload is fast but download is slow. Changed that one too but it didn't help. I just remembered people having problems with certain terminal programs. I personally use Zoc7 for windows because it has the best batch uploading/downloading features. Demo it and see if it helps. Hi, it did not help with zoc7, still upload is fast but download slow. What is the reason with the 19200 top speed? 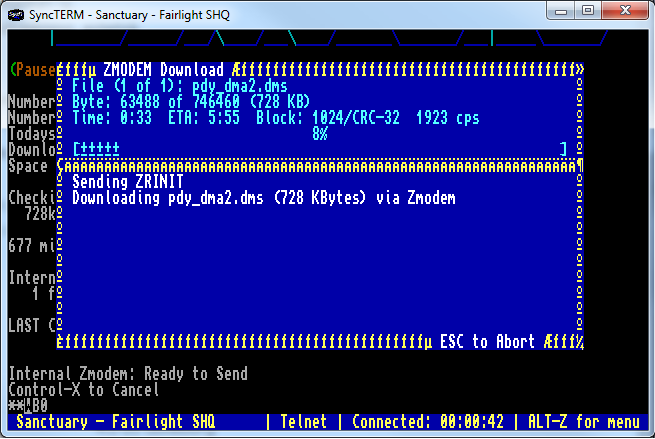 Now both up/download is fast with both syncterm and soc7, also installed xprzmodem.library v3.51. I might get into other problems if I have it higher than 19200? Uploads/downloads were unstable at faster speeds. A lot of errors and batch transfers failing. If it works for you, continue to monitor it and see how it goes. Also, are you transferring over the internet or local lan? You should have someone else test it from the outside at 19200 just in case. I had a friend to test both download & upload over the internet, it went well no crc errors and good speed, he had 95000 cps in download speed. And the files was ok to unpack without any errors. He used Syncterm, I have tried both syncterm och zoc7 on the local lan and it have been ok. I'll leave the settings like this for a while to see if there is any other problems showing up.